Nature observing has now become a passion for many people. People are mostly fond of seeing migratory birds in their leisure time. Isn’t it great to observe nature while sighting in a scope? The Barska Blackhawk Spotter with Hard Case is a perfect tool to use in this fields. Barska is a company manufacturing various monoculars and binoculars and satisfying the customers for years. There are many scopes available in the market, but no spotting scope will provide you so much size and color variation. You can use this versatile spotting scope for not only nature observation but also various purposes like shooting, astronomy, archery etc. The manufacturers have adequately taken care of the fact that you can use this Barska Blackhawk for a more extended period. This scope is much robust than any other spotting scopes available in the market. The hard case that is provided with scope enables it to be much more portable and easy to carry without any tension. And regarding the optics of the scope now crisp clear and brighter images are as easy as you make a phone call. This advanced product will make your pastimes and other activities more and more pleasant. 1. Can we use a digital camera or a smartphone to use on this scope? 2. How long the eye relief of this scope works? 3. Where is this thing manufactured? 4. How long the image stays clear? 5. Can a little bit of stargazing done by it? Most spotting scopes available in the market come in one specific color. But this spotting scope comes in two different shades. One is the gorgeous black, and the other is the vibrant green. The black one is best for the people who are fond of hunting and shooting, and since green is a color of peace, it would be the best choice for the nature observers as well as the hunters. But the variable zoom facility will differ in both the colors of the spotting scope. This Barska black hawk is available in four different zoom specifications. No other scope in the market offers you such variety. But the sizes differ in color. When you choose the green, you get the scopes with 18-36*50 mm and 20-60*60 mm magnification. Both spotting scopes are the angled version of spotting scopes. On the contrary, the black one includes the zoom of 20-60*80 mm and 25-75*100 mm. These are also the angled version. All these Barska scopes are best for hunting purposes. You have to choose the perfect one for you according to your needs. These scopes are also versatile to use. By owning one of these scopes, you can use it for multi purposes. The price range of this scopes varies according to their sizes. 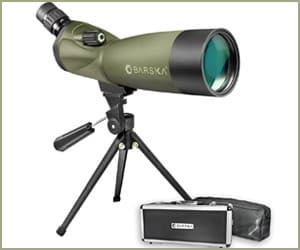 These Barska spotting scopes are more safe and durable during usage. The manufacturers have made sure of its durability and protection. In most cases, the scopes are only provided with a soft case keep them safe from any damage, but the Barska telescope does not only come with a soft case but also comes with a hard case that will keep it safe while traveling. In most cases, spotting scopes get damaged due to accidental falling, but with the spotting scope Barska you don’t have to take tension about that. The flexible rubber coating around the scope allows you to get right. The rubber coating will also not worn out by time since it is made up of high-quality product. It will stay soft and never crack away for a very long time. It is well worth of money. Even it is 100% waterproof. Now the weather won’t be a reason not to use spotting scopes and take extra care of them. The rock solid Panhead rotating tripod will help you to use the scope without any fear of falling. All of these spotting scopes are only available in an angled version. The best thing about using spotting scopes with angled versions is that you can adjust it to your eye level according to your comfort. You can easily use this product whether standing or sitting easily without changing your head position. The optics of this spotting scope is quite best than any other Barska optics. It is perfect to use at a very long distance approximately 500 yards. The lightweight of this scope makes it very easy to use. It weighs around 2.86 pounds. All four of the scopes provide the best quality images in low light, and their lens size varies according to their zooms. They include a fixed eyepiece. You can even read bumper stickers for 300-400 yards. It is also sharp enough to see .223 calibre holes at 200 yards at a regular target. The zooming focus adjusts easily, and you don’t have to put much effort to focus on your subject. The optics are multi-coated to ensure proper light transmission to get the crystal clear images. The tilted eyepiece is very comfortable to use while you are in a standing position. The eye relief of the eyepiece of this scope is perfect because you don’t have to tickle your eyelashes with it. It is suitable for quality shooting and archery. The scope also includes a sunshade to reduce glare from it. The lens is compelling to gather light in low light conditions. So you can use it whenever you want like dawn and dusk. It is also best for both indoor and outdoor usage. The high variable zooming system also ensures the proper adjustment of magnification of desired subjects at desired ranges. The Porro prism included with it helps you to get a wider field of view. Price range is much cheap than many other scopes. Best spotting scope for hunting. Hard case involved for higher level protection. Multicoating ensures the perfect amount of light entrance for crystal clear view. Can’t be used for digiscoping. It is also not good for star gazing. The lens sunshade is made of low-quality materials. Ans: No, This thing is not recommended for digiscoping. Ans: At 40-60 x zoom there is no eye relief. Ans: The image gets a little bit blurry at the highest magnification. Most of the scopes available in the market have this similar problem. Ans: No, this scope is not good enough for star gazing. But great for shooting, archery and nature observing. After reading the Barska spotting scope review, it will quite assure you that it is an excellent value, excellent investment, and fantastic find. Many other scopes in the market will provide you with the same features and same facilities but at a very much higher price rate. But you can easily rely on the company Barska to purchase the perfect product for your choice. By reading Barska spotting scope reviews, you will surely know how to enrich this company is. The review will help you to find out the opinions of the customers, and you can quickly know about the company’s reputation. The manufacturers have designed this scope much well with features at a very lower price rate. So if you want to get the highest performance on hunting or nature observation, then this scope will be the best product for you. So look before you leap try have a wise decision while buying a scope since these type products are mostly purchased only once. And if you don’t think much wisely, then you have to compensate with your money. So don’t look further and try to make the best use of your money by owning one of this products. But you have to be careful while choosing this product. Please at first think about your necessity wisely and pick the perfect one for you among the four. Though there are some lacks in these products, they are quite handy to use. Now it’s up to you to choose the perfect match for your necessity.